« Oh What A Relief It Is! Maybe some rain tonight, and a slight chance for some again tomorrow. Biggest problem, just like today, will be the wind. But, temperatures in the 60s which should continue into Saturday. Downturn in temperatures by Sunday…..more seasonal…. in the 40s which we will see most of next week. The generation schedule has given us no generation every day this week from about 9:00 a.m. until 5:00 p.m. Same scenario for tomorrow. Today was ladies day on the water. eorge, who lives by Bennett Springs. 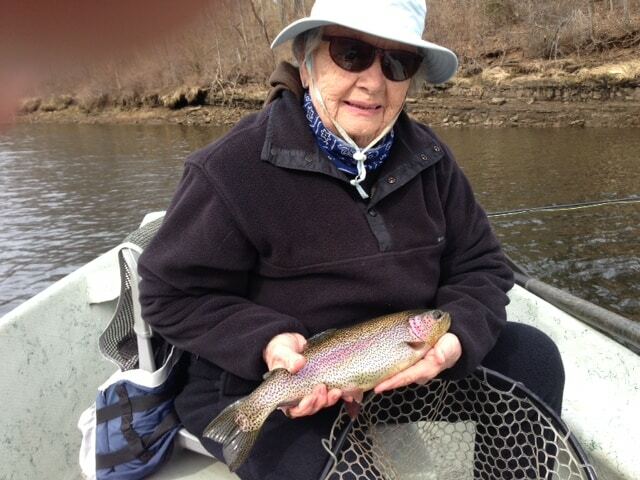 She enjoys coming to Taneycomo for a change in fishing. Great day for George, mainly on the size 18 copper dun midge. Carolyn had Pam, from Texas, and her daughter Tiffany out for half a day. Tiffany just graduated from medical school and this was part of her graduation celebration. Good day for these ladies too. Tiffany started her day off stripping the CQ streamer in olive. The other best pattern of the day was the size 18 copper dun. By the way Tiffany…..CONGRATULATIONS! 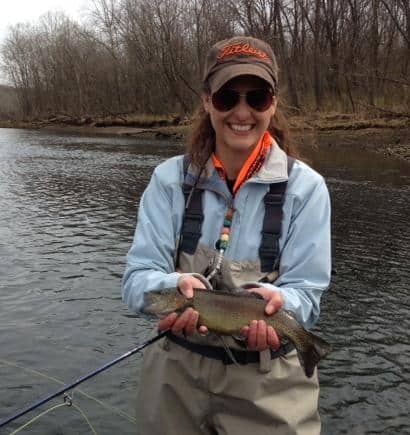 Monday was a very good day for almost everyone on the water. Lots of patterns reported as fishing well. Couple guys came in and said they nailed fish on the Blue Poison. Unfortunatley, it was not working very well on Tuesday but several fishers said Tuesday was a tough day. We did fish the Blue Poison today and it fished well in some places. This entry was posted on Wednesday, February 19th, 2014 at 10:05 pm	and is filed under Fishing Reports. You can follow any responses to this entry through the RSS 2.0 feed. You can leave a response, or trackback from your own site.